For the yard the August day begins at night. At night, dark and dim. Stars fall on your head at mid-month, just when the moon has grown full. Perseus racing in the sky with his winged sandals cut off the hideous gorgon Medusa’s head and the Perseids only fall and fall over our heads but never come to the yard, always falling past, to come again to fall next year. Making a fire to light up the yard at night is fitting now – a much more sensible idea than on Midsummer night that is light anyway. With fire it is of course as with cycling – the wind is always against you, and the road is always uphill. With fire too - the wind always turns to an unagreeable angle however agreeable it was at the fire-lighting moment, or even starts to spin around so that the smoke from the fire definitely will get into every neighbouring yard. The Firemaster himself however must accept the fact that all the branches and stalks and straws that need to be burnt and that have been carefully dried all summer have just at the fire-making moment have got so wet that they make themselves known by a breath-stifling smoke rather than by body-warming fire. But the Backyard Potterer never loses his head, just rinses his eyes in the water bucket that has been brought to the fire site for all sorts of purposes, and tries to boost the fire. Which in some miraculous way succeeds. The spruces observe the flame calmly but warily, and in the morning it can be seen that the birch in the back corner has gone slightly yellow, that the spruces have flattened the tufts of grass with cone bombardment and the pines have answered with a shower of cones that even overshadows the Perseids. What is cause, what is effect the Backyard Potterer hasn’t the time to investigate. Because between the stealthily high-grown goosefeet and ground elders he glimpses red berries on bushes. And indeed – when only the wall of grass got mowed it turned out that the currants, be they red or black, were offering their berries with the stubborn perseverance of earlier years. The Backyard Potterer feels that they are quite happy – nobody has disturbed their righteous peace with springtime branch-pruning or manure spreading, not to speak of summertime weeding. A free-growing berry bush must after all be a sine qua non condition of a free country! We talk on about human rights but quietly acknowledge that it is becoming ever more difficult if not impossible to achieve in every murky backwoods yard. And because of this the fervour has moved over to the animal rights lot, since to bring about animal rights is wonderfully simple – because what can you know about those animals anyway, and the rights that they need. But it is crystal clear that the future of rights searchers belongs to plants rights advocates. Every plant has the right to grow as it wants, cares or takes the trouble to do, and no Backyard Potterers should come to disturb them! And indeed – the Backyard Potterer sees that at the end of August the plants have really made use of their rights. Where he in spring sowed, planted and pricked out all kinds of dills and flowers in the beds there are now only two reliable doers flowering – phlox and marigold. Just like every year. The Backyard Potterer also notes that the birches in the yard – and not only in the yard but old birch friends in the forest – are going yellow in a definitely original mode this year. One year first the lower, then the upper branches, this year first the upper, and then the lower branches. One year first the one, then the other birch, this year the other way round. From this the Backyard Potterer can only draw one conclusion – trees are no insensitive inanimate objects, but spiritual beings that sensitively read the environment and coquettishly play around with their looks. The gulls seem to agree with that as they fly in ever bigger flocks towards the sea in the evenings, reflecting the last rays of the August evening sun on their silvery white bodies. Well, yes, but the gulls fly with the clouds and the August clouds over an Estonian yard are low-trailing as nowhere else, but at the same time as full of shapes and colours as can be. One seems to radiate light, another beside it – the horsehead shaped one, dark and menacing as a soot-seared face of Moses. A third mischievously red, and there, far off something yellowish glints ... 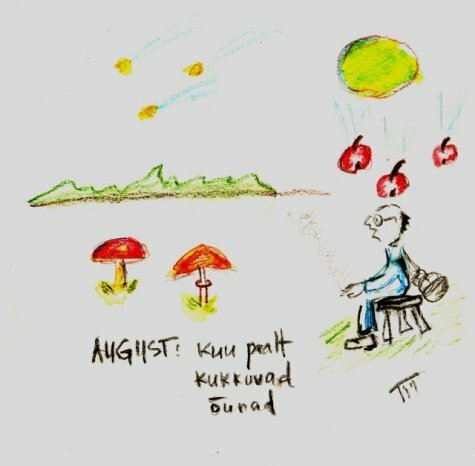 The nuclear mushroom cloud was probably invented in August, because just now fungi start to press up from some below-ground secret depths up into the yard. The mushroom of course is no bird or animal, flower or cauliflower. You must go and fetch it yourself from the forest and you will discover that mostly it outwits you, having made an agreement with the mushroom mosquito, thanks to which its body, however luscious it might be, is left in the forest all the same. Sometimes the mushroom basket even stays empty, so in the future the Backyard Potterer plans to go into the forest with suitably many clay or play-dough mushrooms on the bottom, so that there won’t be the shame of getting out from the forest with an empty basket. But mushroom is mushroom, be it an alga or animal, an it or a s/he, after all it is still the only creature that is fungal. If the story is true that an apple fell on Sir Isaac Newton’s head then surely it happened in August, there can be no doubt about it. So the Emperor Augustus who gave his name to the month should be proud that unwittingly he helped to discover gravitation.